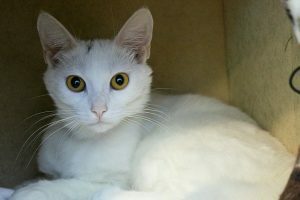 I am Ash — the beautiful 11-month-old kitty who was named after the little smudge mark on my forehead! Other than my beauty spot, I am an all-white girl who is as sweet as I am petite! I am young, social, and still very playful being that I’m just under a year old. Even though I absolutely love people, I haven’t been able to handle being in the cattery at Pixie around the other cats. I may eventually be able to acclimate to a feline friend, but for now it seems I’d be happiest as the only Queen kitty in my castle. Kids and dogs don’t seem to bother me, and I will roll over and flirt with anyone who comes to visit! Since I’m an all-white kitty, it will be safest for me to be indoors my whole life to avoid sunburn and outdoor predators. I’m fine with that though — all I need is love and lap-time from an adoring human to make my life complete! 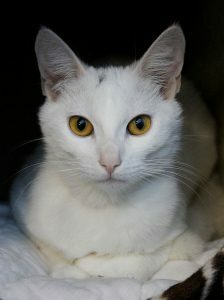 I’m currently living at the Petco Unleashed on NW 23rd & Burnside and can’t wait to meet you — won’t you come say hello? I come you spayed, vaccinated, and microchipped for an adoption fee of $100.